Chaos is dead. Long life Chaos! I am planning to build a new home server (for File Storage and Virtual Machines) in a Norco Case RPC 4224 with 24 hot-swappable Sata/Sas III drive bays. 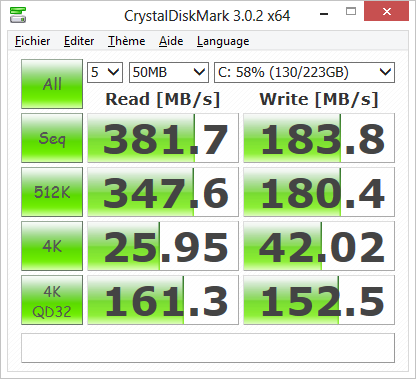 It is intended to replace my current one (limited to 12 HDD). CPU: Intel Socket 2011 (for Core i7). RAM: 8 x DIMM DDR3 (max 64 GB) - Quad Channel Architecture. Storage: 2 x Sata 6Gb/s ports Intel X79, 4 x Sata 3Gb/s ports Intel X79 with Raid 0/1/5/10, 2 x Sata 6Gb/s ports Marvel 88SE9128 with SSD caching, 2 x power eSata 6Gb/s ASMedia ASM1061. Slots: 3 x PCIe 3.0 x16 (mode dual x16 or x16-x8-x8), 1 x PCIe 3.0 x16 (mode x8), 2 x PCIe 2.0 x1. Audio: 8 channels HD (realtek ALC898). USB: 6 x USB 3.0 ports (4 at back panel, 2 onboard), 12 x USB 2.0 (6 at back panel, 6 on MB). a new CPU Intel Core i7-3820 10MB Cache (LGA2011) - Up to 3.8Ghz. a new Liquid CPU Cooler Corsair H80 with 2 x 120mm fans. 4 new x 4GB Ram DDR3-2133 (PC3-17000) CL9Q (9-9-9-24 at 800MHz) G.Skill Ripjaws Z in Quad Channel mode (F3-17000CL9-4GBZH). 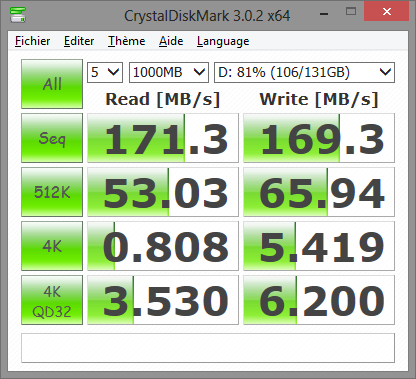 4 old x 36.7GB Western Digital Raptor Sata I 10000 RPM (2 x WD360GD 8MB + 2 x WD360ADFB 16MB) in RAID 0 for a VM. 4 old x 500GB Seagate Barracuda ST3500630AS Sata II 7200 RPM in Raid 0 for VM. one Asus VG278HR 27” (aspect ratio 16:9) with embedded 3D IR emitter and 3D active glasses. 1 old x IDE CD/DVD burner Samsung Samsung Super-WriteMaster™ DVD Writer (SH-S202N/BEBN) with LightScribe. 1 old FlexCage Icy-Dock MB973SP-B Tray-Less 3×3.5″ in 2×5.25″ SATA HDD Cage. 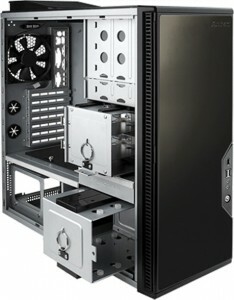 everything is in my old silent Antec Tower Case "Performance One" P182. I know that from Chaos came Gaia (the Earth) and Uranus (the Sky). But all my virtual machines have names of Titans and my physical machines have names of Olympians except my main PC which has always been named Chaos, from the very first one I built. So again: long life Chaos ! Raid 0 with 2 x SSD Kingston HyperX. 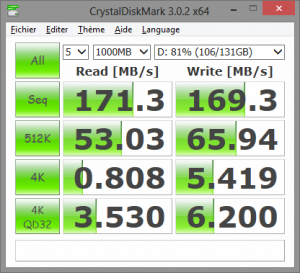 Single SSD Samsung 840 Pro - BEATING the RAID 0 with 2 SSD Kingston HyperX. 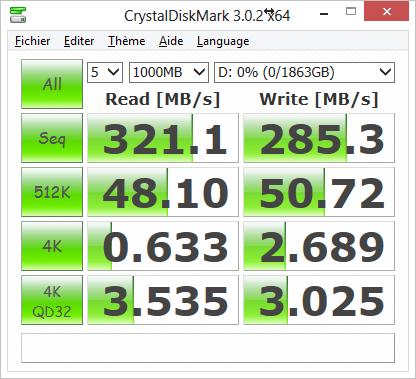 Raid 0 with 4 x WD Raptor 10.000 RPM Sata I. Raid 0 with 4 x Seagate 7000rpm Sata I I - BEATING the RAID 0 with 4 x 10000rpm Sata I.
I did order two great Norco server cases RPC-4224 at XCase.co.uk (renamed XCase RM424). UPS was really not able to manage this correctly IMO. I did call them 3 times (once the packages arrived in France) to tell them I was in Belgium. Fortunately, I had at least a very good communication with XCase's employees during that period. Now that I did solve the "conflict" between the Promise FasTrack and the nVidia RAID, I experience another conflict... with the new LSI SAS 9201-16i that I just plugged in the motherboard (an Asus Striker II Formula). Warning: Have Option ROM can not be invoke (Vendor ID:105Ah, Deivce ID:3701h). A workaround would have been to disable the "Boot Support" in the LSI configuration (the problem only occurs with option "Boot Support" = "Bios Only" or "OS and Bios" in the LSI configuration utility). And this would have been a valid solution for me as I don't intend to boot ever on any disk connected to this controller. Another option would have been to temporary unplug the LSI to get access to the configuration menu of the Promise adapter at boot time. However, to solve this annoying issue, I did try to update the bios of the LSI from its current version (7.5.0.0) to the latest version 7.29.0.0 (The firmware being already the last one: 15.0.0.0). To dos so, I did download the package "9201_16i_Package_P15_IT_Firmware_BIOS_for_MSDOS_Windows" from SLI's Find Support webpage. The command (.exe) comes from the subfolder \sas2flash_win_x64_rel, the firmware (.bin) comes from the subfolder \Firmware\HBA_9201_16i_IT and the bios (.rom) comes from the subfolder \sas2flash_dos_rel. I did copy everything in a single folder. The option -o is to run in advanced mode, which is actually not mandatory to update firmware and bios of native LSI adpaters. But the situation went then really worst. The LSI bios was executing fine, i.e. without warning anymore. But next, nothing else was happening. I could see on my LCD Poster that the PC was trying to load the Boot menu (or enter the setup if I did press DEL), but it was never completing that step ?! I did try to disable the sata controllers on the motherboard and remove the FastTrak controller. Nothing helped (I had to remove the LSI adapter to be able to reach the setup menu). Unfortunately², impossible to find the old version 7.5.0.0 of the bios on SLI's website. I only found a version 7.21.0.0 of the bios on Lime-Tech, a great forum about among others "unRaid systems" (The bios can be found in the package "LSI SAS2116 chipset"). I did the downgrade but that didn't solve the problem. It was a bit different however as the LCD poster told me that the boot sequence was stick on "Bios Init" instead of "Boot Menu"... (which was worst IMO). Notice that I was only able to downgrade the Bios. The firmware might not be downgraded. Trying to do so resulted in a message : ERROR: Cannot downgrade NVDATA version 0xf000003 to 0xa030001. I did rename the Shell 2.0 (to be tried first) into shellx64.efi and copied it into the root folder of my USB key. I did also print the EFI shell user guide. I did plug the SLI adapter and the USB key into my Asus P9X79Pro. During the boot, I entered the Bios Setup of the ASUS, in Advanced mode. In the "Exit" menu (In the top-right corner), I did select "Launch UEFI Shell from filesytem device. From the start screen of the shell, I took note of the name of the USB device which was displayed automatically (otherwise I would have had to type the command 'map'). The name was "FS0". To exit the EFI editor press the “F3” key (or type "Esc 3" depending on your system. Unfortunatelly++, after several tries to flash from the UEFI shell, I decided to give up and try something else as I was clearly not able to execute the updater from the shell (But for sure, I will come back into that UEFI shell to learn how to use it correctly). I read that many people did recommend to clean the firmware and the bios before upgrading. This can be done with the command: sas2flash -o -e 6. Unfortunately, this operation is not supported in Windows mode and must be executed in Dos mode, which is not possible for me on the Asus P9X79Pro as mentioned above (error 'Failed to initialize PAL). What a nightmare! A miracle! That version solves both the boot issue when the LSI is plugged on my Asus Striker II Formula and the warning message when the Promise is plugged too. 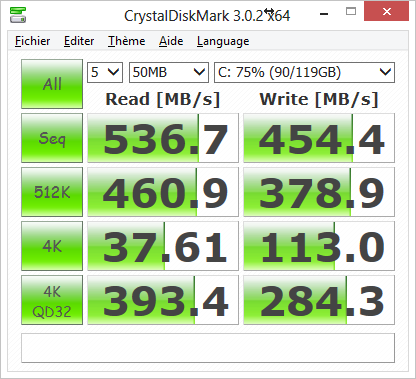 And icing on the cake, 3TB disks are well supported and I can boot from disks connected on the LSI adapter (although that's not at all my purpose - reason why I will disable Boot Support on this adapter). [EDIT]: In a next post, I report on re-using this experience to make another LSI, a SAS 9211-8i, compatible with my ASUS Striker II Formula too. I initially though that the default driver installed with Server 2012 for the nVidia ForceWare network adapters of my motherboard did not support Wake-On-Lan (as reported sometimes for other brand). But after installing the latest drivers from Asus website, WOL was not yet effective... All the settings of the machine were the default ones (issued from the installation) as I didn't touch any of them yet... So I started to enable/disable/reenable plenty of various settings before being finally able to remotely wake up my PC with a Magic Packet (I am using the "WOL" page of my Buffalo router for sending those messages). First, notice that depending on the Motherboard, Wake-On-Lan could work for you only if your PC is in a Sleep mode or in an Hibernate mode. Mine can be waked-up from a full shutdown (as most recent/decent motherboards :) ). In the Computer Management > Device Manager > Network adapter > right click Properties on "your adapter"
"Wake up capabilities" must be "Magic Packet" or "Both"
"Wake On Lan After Shutdown"
WOL however only started to work for me when I did disable "Device Sleep on Disconnect" in this advanced tab. Microsoft White paper on this topic here. Power On By PCI/PCIE Devices < I have this one. It includes "Onboard Lan". Nothing else requires to be enabled in the Bios. I am using Windows Server 2012 Essentials (quite a replacement for WHS 2011 although not exactly) on my Home Server for File Storage, Media Sharing and centralized PC backups. I also plan to use it to run Virtual Machines. However, I actually don't care about most of the "Server 2012" features. So, I "fine tune" the server to make it more user-friendly. I will keep track of the changes I do, and other useful tips, here (Edit: I found an interesting web site here to convert a server 2012 into a workstation, including a wizard). To edit system files such as the "host" file (in C:\Windows\System32\drivers\etc), the editor (e.g. : notepad++) must be run "As Administrator", otherwise, the changes may not be saved! I need this to define some hostnames (among other to access my blog using its internet address as I don't use a DNS server in my local network). Type cmd on the Start Screen and execute Command Prompt with run as administrator. In the command prompt, type: powercfg.exe /hibernate on. Type Power on the Start Screen and select Settings under the search box. Execute next Change what the power buttons do. Select Hibernate in the combo of the Power button settings. Check the option Hibernate in the Shutdown settings. Click now Create a new Power Plan (e.g. : based on the Balanced plan and named "Hibernate"). Your new plan becomes the current one. Click "Change Plan Settings" to edit you plan. Select your plan in the combo if it is not the displayed one. Under Hard Disk > Turn off hard disk after, select (e.g.) 30 minutes. Under Sleep > Hibernate after, select (e.g.) 60 Minutes. Under Media Settings > When sharing media > Settings, select "Allow the computer to sleep", although the server is really used for Media Sharing. In my case, the feature is enabled, but I mainly use my NAS for media sharing. Notice that I still don't see "Hibernate" in the Power Menu available from the Start Screen. It's only available when closing Windows from the Desktop with Alt-F4. Notice also that if you have disabled an onboard Graphic Card within Windows because you did install another one, sleep states could also be disabled. Instead of disabling the onboard card, configure the display to be "disconnected" (Option of the Display > Screen Resolution). Final notice: Sleep modes seems to completely set "off" one of the NICs. If you want to get rid of the dialog box, then select 'Disabled' for Display Shutdown Event Tracker. To restore the default then check the 'Enabled' box. The change will be effective immediately (No need to reboot). In the tabs Domain Profil, Private Profil set Firewall state: "Off". Possibly keep it "On" in the tab Public Profil (In my case, the server won't be connected to a public network ever). Use the psShutdown command from SysInternals. In the right pane, in the section Properties, click at the On link behind the IE Enhanced Configuration setting. Switch the setting to Off for both Administrators and Users to disable the restrictions. In the Run Dialod, type gpedit.msc -- this will launch the Local Group Policy Editor within the Microsoft Management Console. Select Computer Configuration > Windows Settings > Security Settings > Local Policies > Security Options. In the right-side pane, Select the Policy "Shutdown: Allow system to be shut down without having to log on" and change the value in the Security Setting column to be "Enabled"
Give a name to the New Team and Click OK. No need to change defaults in the "Additional properties" section. On the Start Screen type "Power" and run "Windows PowerShell"
In the Properties pane, find "IE Enhanced Security Configuration" and click on its value to change it. Transferring a lot of small files is very very slow (a few KB/s instead of at least 80 MB/s for large files). This is due to latency... For such file transfer, it is far better to use FTP. On the Start Screen, Click the Server Manager tile, then click Yes. I don't use my Server 2012 as an actual Server 24/7 with Domain Control (centralized credentials), DHCP, Group Policy, VPN etc... Instead, I did configure on all my workstations to prevent them to be enrolled by Server 2012 Essentials when they access it for the first time. On your client computer, go to Start (Win7) or Start Screen (Win8) and search for command prompt “cmd“. Execute cmd.exe with run as administrator. Click on "Dowload software for Windows 7 and Windows 8"
Execute the ComputerConnector(xxxx).exe just downloaded and follow the wizard. When prompted for a login and password, use the credentials of an administrator defined on your Server 2012. To access the Dashboard through Remote Desktop, you also have to provide the credentials of the an administrator defined on the Server. Fortunately, there are all the required utilities to create bootable devices (floppy, usb or CD) on the Bootdisk.com website. not practical to use a CD as even if it's not a read-only one, to add some exe/files for the purpose of the operation is not always as easy as with a usb key. As far as you are concerned with creating a Bootable USB Key from a Windows Setup ISO, You may simply use the "ISO to USB" tool. For Windows 7, use the Microsoft "Windows7-USB-DVD-tool" - Official "Windows 7 Setup ISO" being available here. 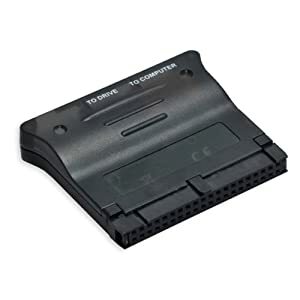 If for any reason you need to access an old IDE device from a PC with only Sata controllers or if you want to access a Sata device from an old PC with only IDE controllers, you need a SATA to IDE or an IDE to SATA Adapter. 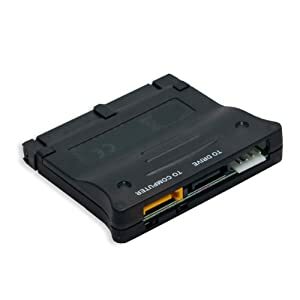 Actually, if you don't want to keep the device plugged for ever on the PC, the best option is to buy a device a little bit more expensive (~10€): a SATA to IDE, IDE to SATA Bi-Directional Adapter. I did buy one from Syba which is great (and efficient): the "SD-ADA50016". Notice: I have no issue with it but it is based on the SunplusIT SPIF223A chip which is not reported of the best one. Users complains about very poor performances (as low as 4MB/s) and recommend other models. From my own experience, it's indeed very slow but it is actually equal close to Blue-Ray speed 1X (4.5MB/s) with my DVD burner. reuse an expensive DVD Burner in a new machine (although you have great portable ones for less than 30€).